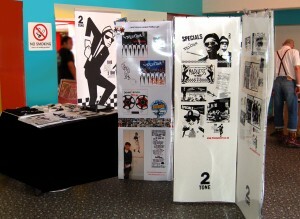 A 2 Tone Posters Mini Exhibition will be at SKAMOUTH at Vauxhall Holiday Park, Gt Yarmouth, Norfolk 2013 October 18, 19, 20 & 21. It will be great to see old and new friends at this amazing event that showcases so much including performances by Neville Staple, The Uptown Collective of Winston Reedy & Pressure Tenants, Dave Barker, The Dualers. King Hammond & Spirit of 69, From The Jam & Bruce Foxton and many more. The Ska Co-op in association with Folkestone Festivals present the original and official Folkestone Ska Festival for 2014 of top bands and DJs. It takes place in the striking, fabulous venue of Leas Cliff Hall and Channel Suite and on The Leas. It connects with its community free Harbour roots with small stage and harbour pubs. Boss Shots Lawn, A Scooter Park, Ride Out and Ska Market. 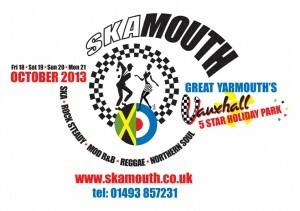 it is the ONLY top ska, rock steady, reggae, northern soul. Mod R&B event to be at. MAJOR LINE UP to be announced soon. Leas Cliff Hall tickets and box office opens very shortly. The Leas and Harbour will be a FREE community area. PLUS! – TICKETS ON SALE SOON for the “SKA AID” benefit gig at Leas Cliff Hall on SATURDAY JANUARY 18th, 2014. The Dualers, TootNskamen, Hey Rudi and many other bands and DJs are giving their services free, in a groundswell of support for local small businesses and services that have suffered financial loss in the aftermath of 2013’s event … most know why. You are currently browsing the classic 2-tone graphics news archives for October, 2013.